Least productive of them all. The Economist shows one reason why housing is so expensive and unaffordable. 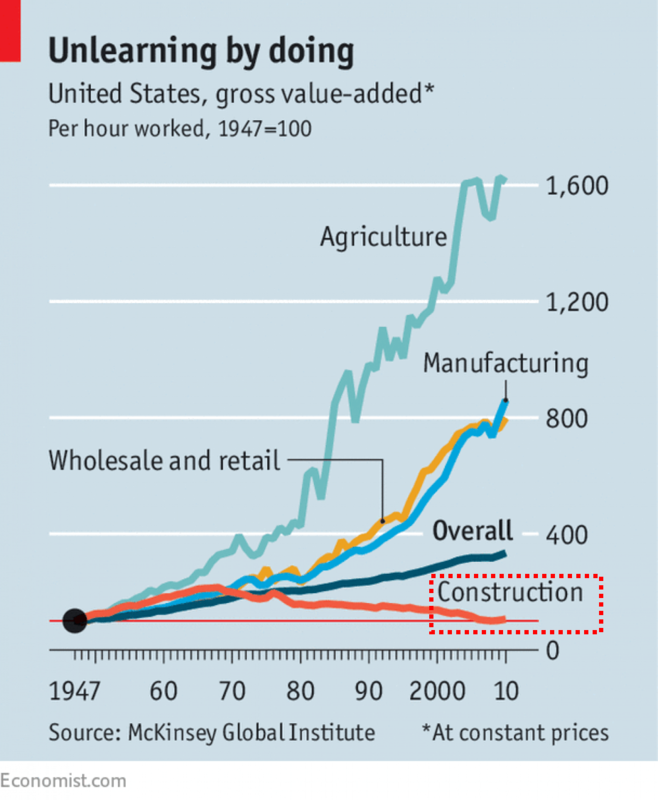 Construction is the one of few industries with negative productivity growth, with 50% decline since 1960. This latest article from The Economist says the productivity in construction is reduced globally. Reasons are twofold: industry is hiring more workers to replace machinery and it has failed to consolidate. The industry has been burnt by past recessions and finds it easier to fire the workers than taking losses from in capital-heavy investments. US has 730,000 builders with average size of just ten, thus margins are very low. Additionally, tt is very hard to scale due to very high variation in building codes across the county requiring each project to start from scratch. Past attempts of mass producing houses failed resulting in setbacks & sour memories.